Click for a current list of volunteer opportunities. Click to register for one of these sessions. Companion is the word we use to describe volunteers. 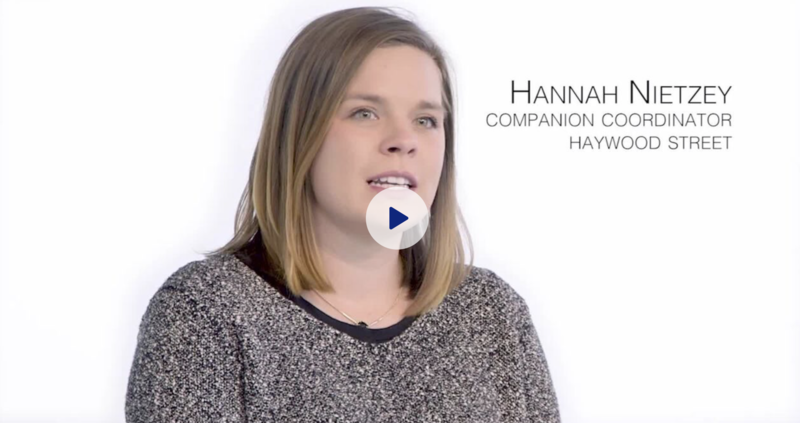 The invitation to be a companion at Haywood St. is a unique and transforming experience. It requires a new way of “seeing” others. The invitation begins and ends with the recognition that each person is a child of God – each with gifts and each with needs. Getting involved at Haywood St. requires stepping out of your comfort zone. You will find homeless folks preparing and serving the meal. You will discover folks in three piece suits or hospital scrubs coming only to eat. This ministry turns the notion that the homeless are helpless and the housed are the saviors on its head. If you are accustomed to only serving others, you’ll be invited to be served. If your gifts have been overlooked or dismissed, you’ll be put to work. It’s a joyful and often chaotic ministry. One that requires openness, vulnerability, and flexibility. You’ll make new friends and experience a joy only authenticity can uncover. For more information about volunteering at Haywood Street please contact Hannah, our Companion Coordinator, at Hannah@haywoodstreet.org or 828-575-2477, ext. 106.